The variety of vegetables used in this Vegetarian Delight gives it an attractive colorful appearance. It is very easy to prepare and this menu is easy to cooking. 1. Heat a large skillet and add the oil and garlic. 2. Add all the other ingredients. Stir-fry for 4 minutes, until the vegetables are crisp tender. 3. Serve with steamed jasmine rice (khao suay). 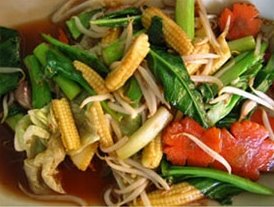 Enjoy your cooking for Pad Puk Ruam Mit is Vegetarian Delight of Thai Food.